American battle flags in general, and those of the American Civil War in particular, are among the rarest categories of Stars and Stripes in all of flag collecting. 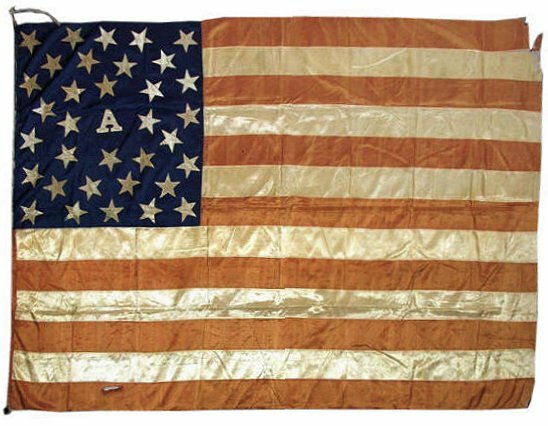 Company grade Union Stars and Stripes, such as this flag belonging to Company A, 16th New York Volunteer Infantry, are among the most beautiful and cherished artifacts to have survived the struggle. This particular flag descended in the family of Captain Isaac Merry, who originally enlisted but later became the company commander of A Company. Flags such as this were often sewn by a commander's wife or by the women of the community from where the unit mustered. These homemade flags are known as "Presentation Colors", because they were presented to the units by their loved ones and communities, and were not of standard military issue. They vary greatly in design and construction, and collectively, those few that survive represent some of the most folky and charming flags of the era. Although units typically carried their standard issued colors, presentation colors were carried during ceremonies or in even in battle, if the unit's issued colors were lost or damaged beyond use. This particular flag survives in a remarkable state of preservation, and is a magnificent example of an exceptionally rare category of American flag.